Open any college neuroscience textbook to the chapter on sensory perception and you’ll quickly learn that you can’t tickle yourself, no matter how hard you try (and chances are, upon reading this, you will try). As this phenomenon suggests, the brain makes a distinction between self-produced touch and touch from other people or objects. Now, new work from Håkan Olausson, Linköping University, Sweden, and colleagues enhances the understanding of brain mechanisms underlying different forms of touch sensation. 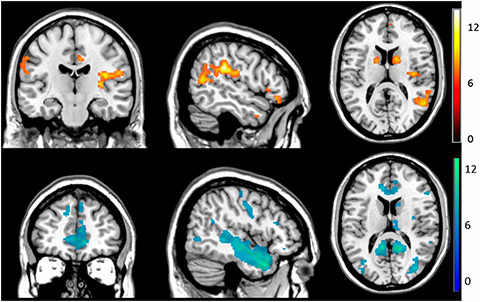 The researchers used blood oxygen level-dependent (BOLD) functional magnetic resonance (fMRI) neuroimaging in healthy human volunteers to show a profound pattern of deactivation throughout the brain during self-touch, while regions involved in somatosensory processing, social cognition, and salience were activated during touch by others (other-touch). Meanwhile, experiments measuring somatosensory-evoked potentials (SEPs) also revealed this self- versus other-touch distinction, at both the cortical and spinal level. While the study looked only at touch, the researchers believe their findings may also have implications for the study of pain and analgesia. The research was published February 5, 2019, in the Proceedings of the National Academy of Sciences. First author Rebecca Böhme, Linköping University, Sweden, said that she and her colleagues set out to understand the neural basis of different kinds of touch, a sensation that is crucial from an early age. To learn more, in their first experiment, Böhme and colleagues had 27 healthy human volunteers undergo fMRI during three different conditions: while they stroked their own forearm with two fingers (self-touch), as if stroking someone they liked; while they had their forearm stroked by the experimenter (other-touch); or while they stroked a special sand-filled pillow with a skin-like cover (object-touch), which was used as a control for movement during self-touch. The investigators found significant differences in fMRI activity between the other-touch and self-touch conditions. In the former, they saw activation in areas including the somatosensory cortex, insula, striatum, amygdala, cerebellum, and prefrontal cortex, regions known to play a role in social touch and social cognition. But in the self-touch condition, they saw a widespread pattern of deactivation, including in the insula, anterior cingulate cortex, amygdala, and prefrontal areas, as well as in the thalamus and brainstem, which are involved in early somatosensory processing. They also saw a lack of activation in the right primary somatosensory cortex (S1), contralateral to the touched forearm. Comparisons with the object-touch condition showed the deactivation was specific to self-touch and thus not related to movement. “I was surprised that the deactivation pattern was so distinct. Often in fMRI studies, you get small differences, but the magnitude here was quite strong,” said Böhme. The group also saw “conjunctions” between other-touch and self-touch conditions, where there was an increase in brain activity in certain regions like the amygdala, right striatum, and prefrontal areas during other-touch, while there was a decrease in activity in those same regions during self-touch. The researchers then employed the same touch paradigm in a second study that confirmed the results of the first. But in addition, they used different tests to assess the impact of the deactivation in the self-touch condition on subjects’ perception. Of particular note, they used von Frey filaments to stimulate the forearm during each of the touch conditions and found that when participants were engaged in self-touch, they required 100 times the force to detect the weakest filament. This increase in detection threshold was higher than the force needed to activate nociceptors. Furthermore, the team found that drawing subjects’ attention toward their arm had no effect on the brain deactivation seen during the self-touch condition. They were able to show this by providing a monetary reward to subjects when they correctly answered when a von Frey filament was applied to the arm during the self-touch condition (in these experiments actual stimulation with the filament occurred a little less than half the time). The second study also revealed differences in the location where subjects perceived touch, using a 0-10 scale where 0 equaled the left arm and 10 the right hand. This revealed that other-touch was felt on the left arm, while self-touch was rated as in between the left arm and right hand. Additional fMRI data showed that differences in touch processing between the self-touch and other-touch condition depended on subjects’ “self-concept”—on how sure subjects were about what kind of persons they are. Here, those who were less sure of this showed less of a difference in BOLD signals between self-touch and other-touch in the left ACC and left insula. Finally, in a third study, the researchers stimulated the base of the thumb, to target the radial nerve, using an electrode that delivered non-painful pulses during each of the three touch conditions. Using recording electrodes at the C6/7 cervical level of the spinal cord, and on the scalp, the researchers saw lower SEP amplitudes during self-touch at the cortical level, compared to the other-touch condition, which the researchers say is in line with the widespread cortical deactivation they saw in the fMRI studies. They also saw shorter SEP latencies for the other-touch condition at both cortical and spinal levels. This hints that top-down modulation is at work during early sensory processing, as early as in the dorsal horn. The findings, Böhme said, suggest that the brain de-emphasizes self-touch signals, modulating them in a top-down fashion from the cortex down to the spinal cord, supporting previous studies in animal models. Self-touch as a form of anesthetization? Greenspan said the study was “well thought out,” and he looks forward to seeing follow-up work. Böhme hopes to follow up with a deeper connectivity analysis that will look into how the different brain regions may be communicating with one another during the different touch conditions, to better understand the neural mechanisms behind the profound deactivation pattern they saw. Given that pattern, along with the 100-fold increase in tactile thresholds during self-touch, she also thinks the new findings have relevance to pain. Image: Boehme et al. Proc Natl Acad Sci U S A. 2019 Feb 5;116(6):2290-2299.